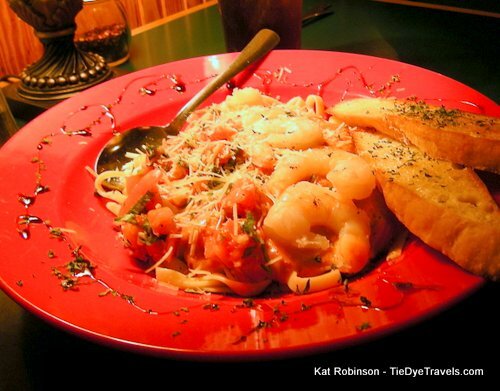 Romance and Italian Food Go Hand in Hand at Katherine's Cafe Amore in Eureka Springs. Ah, romance. There are things in this world that just cry out romantic… roses, Valentines, those cute teddy bears with magnets in their noses that look like they’re kissing. And Italian food. It’s ingrained into us through film and television. Those proposals in a dark restaurant when someone’s playing a violin and Chianti pours from a wicker-clad bottle. Dean Martin and Frank Sinatra and “That’s Amore” and even the scene from Lady and the Tramp where they’re eating spaghetti. Italian food means love. That’s exactly the sort of vibe I got when I walked into Café Amore in Eureka Springs. We’d headed up there for a variety of reasons, including the chance to enjoy the Food and Wine Weekend (which was incredible). But the bigger reason was the celebration of our 10th wedding anniversary. 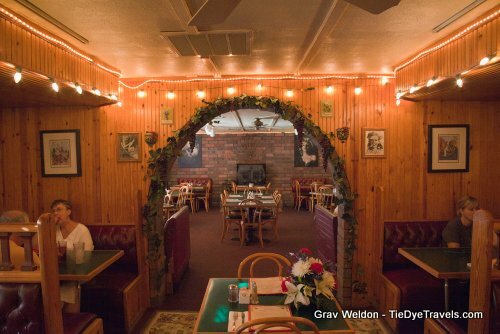 The restaurant was comfortable inside, not too dark but with plenty of accent lighting and little lamps on tables. There was some local artwork and framed signed photographs here and there. We were told to sit anywhere we wanted and found a nice booth tucked back in a corner. We started with the House Sampler ($7.95), a combination of Caprese Salad, bruschetta and olive tapenade served up with flatbread crackers and drizzled with a sweet balsamic vinaigrette reduction. 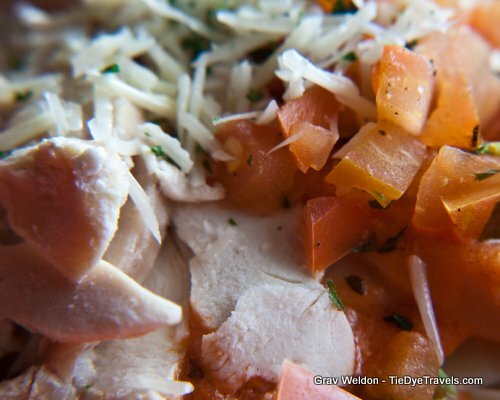 It’s a departure from the norm -- instead of thick slices of Italian bread that tend to be the star of the show, the bruschetta and tapenade were presented as toppings for the crackers, and it worked. 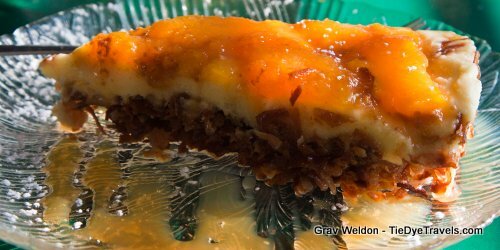 What worked better was that reduction sauce -- tart and tangy and sweet and a really wake-up for the plate. We dallied through the menu in search of dinner, contemplating pizza before absorbing ourselves in the dinner menu. 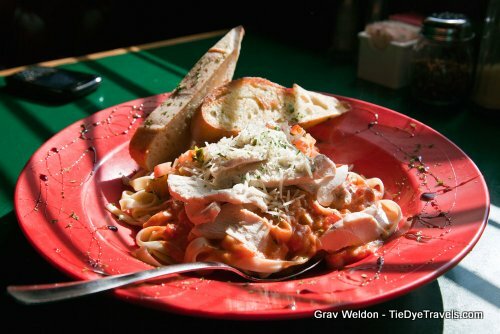 The hubster chose Scampi D’Amore ($17.45), Fettuccini in a creamy pink sauce topped with the bruschetta mix and five plump shrimp. For once, really, these were shrimp to brag about. I cannot tell you how many places and how many times I’ve encountered overcooked shrimp -- but not here. They were pink and perfect and just lovely atop the noodles. 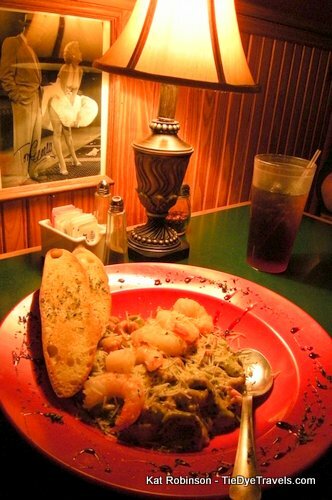 I went for the Tri-Colored Cheese Tortellini with Pesto and Shrimp ($12.95 or $16.95 with the shrimp), and was happy. Café Amore’s pesto is creamy and full of walnuts, and it gives a meaty feel to the dinner. 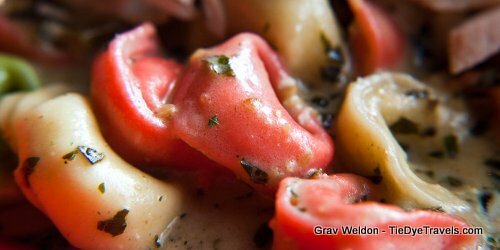 The tortellini were bright and soft, and once again the shrimp were cooked to perfection. And that balsamic reduction was present here, too -- drizzled on the rim of the plate. It was fantastic to sop up a little with each bite, a bright and tangy counterpoint. And after trying the sauce, I want to go back and try the Pesto Pizza with its mozzarella, tomatoes and Parmesan. All the sauces at Café Amore are made on-site, and it shows. The freshness was well-received. 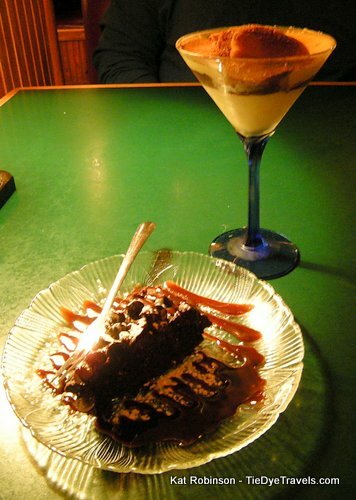 Our hostess talked us into dessert… boy, did she ever. Saucy descriptions were better than the clearest full-color illustration money could buy. We were hooked. The hubster went for the Tiramisu Amore -- traditional Tiramisu but with layers of amaretto, brandy and rum within. Lick-the-glass-clean good. I chose the Slow Death by Chocolate cake, a multi-chocolate cake that’s cooked in a water bath, which gave it this amazing texture somewhere between a custard and a brownie, just full of smooth chocolate and dark chocolate and chocolate chips. Almost too much chocolate, but hey, it was a special occasion. All desserts run $4.95. Other choices include crème brulee and Grandma Gerrie’s Carrot Cake. Café Amore also does wine -- $3.95 a glass for the usual suspects (Cabernet Sauvignon, White Zin, Merlot, Chianti, Chardonnay) and has a wine list as well. There’s beer on tap, served in chilled mugs, and something called a Sicilian Margarita. We have got to stop back in some times and try the pizzas -- the diners at the table nearest ours kept raving and ordered a second. The dough is made fresh daily, and the meatballs are hand-rolled. 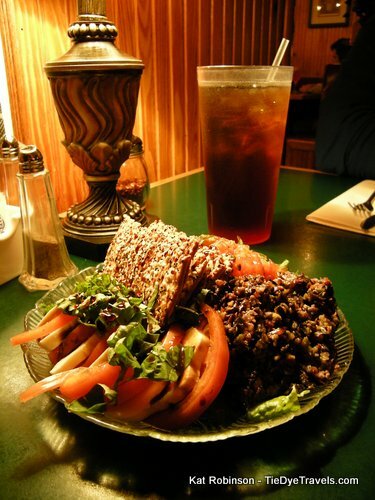 You’ll find Café Amore across from the Pine Mountain Jamboree on Highway 62 in Eureka Springs. 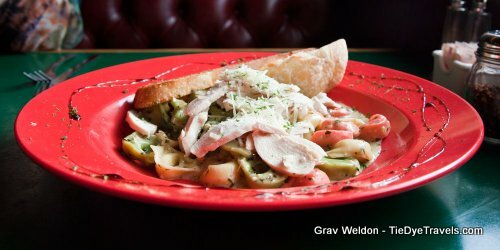 They’re specifically a dinner-only joint, opening at 5 p.m. Thursday through Sunday. Take someone you love. (479) 253-7192. 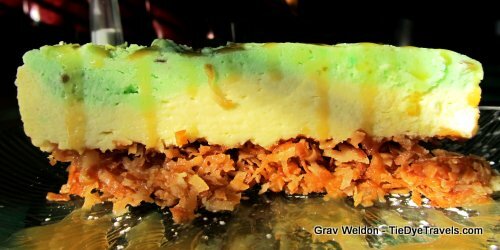 Grav and I checked out Katherine's Cafe Amore during the Fleur Delicious Weekend in Eureka Springs - and discovered marvelous cheesecake pies on coconut crusts.